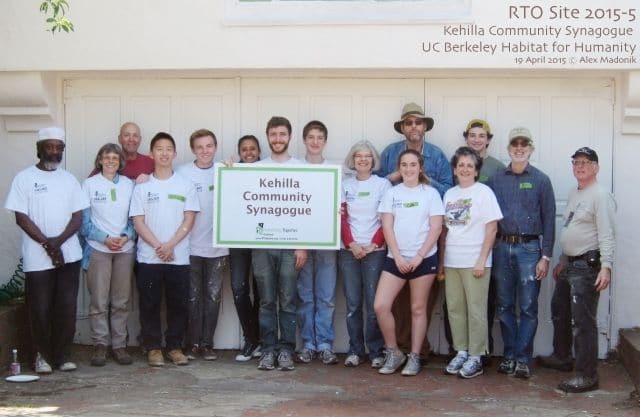 Kehilla has worked with the nonprofit organization, Rebuilding Together Oakland, for a dozen years, providing free home repairs for low-income residents in Oakland. Typically, we partner with Temple Beth Abraham and Temple Sinai to provide financial support and a robust crew for the project. 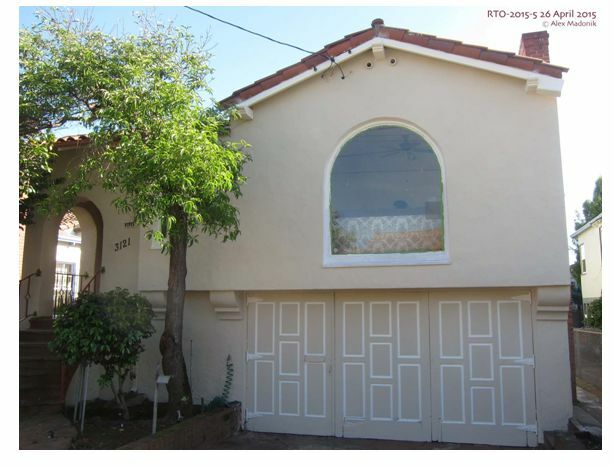 This year’s project, repairing the Fruitvale Avenue home of Mrs. Bertha Underwood, was a bit more low-key as these partners were unable to participate. RTO’s tireless staff, however, found us new partners in veteran House Captain Harris Miller and the skilled team from DPR construction, plus extra helping hands from the student Habitat for Humanity group at UC Berkeley. Our goals were to clear decades of hat-making materials and other accumulated stuff from Mrs. Underwood’s home and then repair and repaint water- damaged walls and ceilings. On the morning of April 11, the Habitat team, led by Ethan Xu, were the first RTO volunteers on the scene, working with Harris to remove flaking lead paint while also filling a huge dumpster with debris from the back yard. Harris, Kehilla’s Bob Olken, and I led small but dedicated teams on three successive Sundays (April 12, 19, and 26). Bob’s wife, Amy Shutkin, made sure the Peet’s coffee and Noah’s bagels were there bright and early each day. Mrs. Underwood met us each morning with one of her spectacular hats and a matching outfit, while her son O.J. was ready to work from the moment we arrived. On April 12, we primed much of the exterior. This work was completed by DPR on April 18 along with interior wall and ceiling repairs. Ethan and several students joined us on the 19th to prime the interior. The Kehilla team included Larry McSpadden and his wife Julie Mills, plus their son Alex, as well as Wendy Kupsaw, Kate McGlynn-Mandel, and Tree Gelb Stuber, aided by Louis Teitelbaum of Temple Beth Abraham. When we returned on April 26, the interior painting was completed, and our task was to paint the exterior trim, including the eaves. We were a smaller group that day (Kehilla’s Nelson Max was there, along with my friends Max Weinryb and Bob Farrell; Kate and Louis returned as well). Progress was slow because much of the work required high ladders, but by the time we left, the front looked great and most of the side window trim had been painted. RTO was able to complete the painting later that week with a small professional team, and Mrs. Underwood was overjoyed at the transformation of her home. Many of our volunteers are veterans of multiple RTO projects, and continue to find them rewarding. We will start rallying support early for our next project, both within the Kehilla community and with our traditional partners in the larger community. I know I’ve learned a lot from our skilled volunteers and RTO’s amazing House Captains, and there’s no doubt we’re making a difference in the Oakland community.